During the weekdays I watch the world cup matches in the library. Yes, our Journalism School has flat screens everywhere in the building. 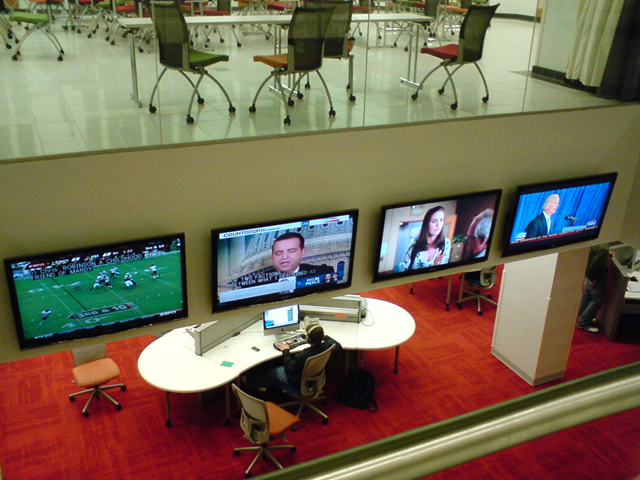 In the J school’s library there are three flat screens. Of course all TVs are on mute if you are wondering. Hence, I use my computer to hear the match’s audio. In the first two pictures, Brazil vs. Chile match. Thank you J School’s library! Uncle Leo: They don’t just overcook a hamburger, Jerry. Jerry: C’mon, you’re lucky to have anybody. Leo: But she’s an anti-Semite. Defamation is the latest film I have watched and it is one of the best because it was a mind blowing. The writer and the director of this documentary is Yoav Shamir an Israeli filmmaker. Shamir travels to Poland and USA to investigate and learn more about this anti-Semitism business. Whether you are Jewish, Christian, or Muslim you should watch this movie to grasp to what level Israel has went to protect this trade mark. I found the movie on YouTube. It is worth your time. Watch and learn! Since September 11, 2001 until many years to come, many American Muslims received and will receive visits from FBI agents to have a chat. Asking questions about other Muslims in the community, whether they know people who may do harm, or who are involved in illegal activities, etc. I wonder what an American Muslim who is father of American born Omar and Fatima answer his children when they ask him why FBI agents come to their house asking questions. And I wonder what he answers his children when they ask him why the FBI agents visit their house only and not their friends Mary’s and Michael’s father. Here is a video that was posted on youtube by a part time peace volunteer for Palestine who got a visit from two FBI agents. For Muslims in America to know their rights. For people in the Middle East to see how human’s rights are respected. What I don’t understand about this video is how come the activist who taped the interview was allowed to post this video on the internet, is this legal? Doesn’t this video expose the identity of FBI agents? Although, she refused to answer their questions still this is an interview and she posted it to the public to see. Regardless of whether you like or dislike the action of the activist or the FBI agents the video is worth watching. Taylor Mali – "What Teachers Make"
While exhausting my laptop today running many simulation experiments I noticed it became slower than usual. The fan was working but for some reason it got extremely hot from the bottom. 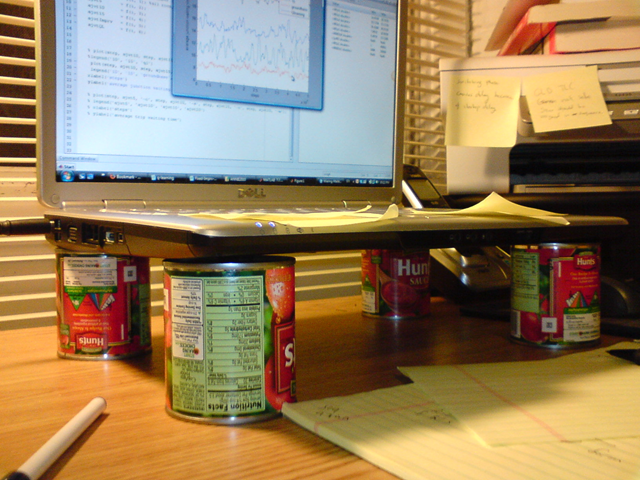 Since I don’t have a laptop fan pad, and I needed to solve the heating problem, I figured out of something to raise the laptop and make some circulation from beneath. It might look stupid but hey it solved the heating problem. I have to buy one of those fan pads soon before I decide to cook pasta. For football (called soccer in USA) fans, USA is not the place to watch world cup. I am not a big fan of this game but I like and enjoy watching a good game. Americans actually mock and make fun of this game. And it is the least favorite among Americans after American football, Baseball, and Basketball. You may see kids play soccer but rarely you see 20 or 30 something play this game. Below is a chronological list of world cup during my life. My age in world cup years is only 10! 1974 Kuwait I was one year old. 1978 Kuwait I was 5 years old so most probably I was put to sleep before the games start so I don’t disturb people watching the game in our house. 1982 Kuwait Strangely, I have a vivid memory of this one since Kuwait was participating for the first time and the whole country was on adrenaline. Free air tickets were given to Kuwaitis who wanted to go to Spain to watch their team. 1986 Kuwait One of my favorite world cups. I don’t know why but I enjoyed watching the games and three Arab countries were in this world cup. 1990 Jordan Studying for Tawjihi (general secondary examination). 1994 Jordan Senior year in college. 1998 Malaysia Working on my master’s thesis. I watched 2/3 of the games alone because they were aired after 3 am. 2002 USA Second MS thesis. Watched Germany vs. Saudi Arabia game (8-0) in a room full of Saudi students. It was a memorable day. 2006 USA Working on my PhD. Missed watching many of the games due to work. 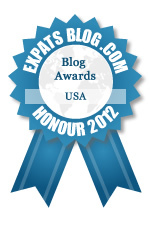 2010 USA Will be teaching a summer class while working on my PhD dissertation. For a photocopier to be able to make copies of a document it needs to scan the original document stores it then start making copies. My assumption was that photocopiers store the scanned original document in a short term memory, I was wrong. Since 2002, digital photocopiers store a copy of the original document in a hard drive not memory (according to the video). Why? I don’t know. I always thought photocopiers don’t store any data permanently but since they use hard drives then they can store as much data as possible. Watch this interesting video to see the risk behind such technology specially for companies dealing with sensitive data. Finally, I canceled my twitter account. I had it for more than a year but never tweeted. Since I was following some people and been followed as well I used to check it quite frequently. Twitter might be useful to some people and it actually serves a purpose, in some occasions, but I found it has no value to me. If I am going to miss any tweets it would be Queen Rania’s. I was following her tweets but she didn’t follow me 😦 . Nevertheless, my iPod is working magic keeping me connected digitally. For now, facebook is still the best -digital- social network tool. Roar facebook, roar!